A backyard trampoline is a great addition to your home, but picking the wrong one can not only be expensive but dangerous. Whether the trampoline will be used for a gymnast to practice at home, or family fun for kids and adults, it’s important to pick a sturdy and safe trampoline. We have researched all the options for backyard trampolines, with value and safety as the highest priorities, and recommend Skywalker Summit 14′ Rectangle Trampoline with Safety Enclosure as your best option. In addition to our best trampoline pick, we have identified some other trampolines for specific needs. We have included the best rectangle and square trampolines, the best in ground trampoline, the best trampoline with a basketball hoop, the best trampoline tent, and the safest trampoline which is springless. The features of this trampoline include: Reinforced T-bracket construction provides greater structural stability at each enclosure and trampoline joint. Patented No-Gap enclosure system attaches net to jump mat at each spring, eliminating gaps. Tightly woven polyethylene enclosure net for excellent durability and UV protection. Woven jump mat made of heavy-duty UV protected polypropylene to prevent slipping. Thick, UV resistant PVC spring pad. Meets or exceeds ASTM safety standards. 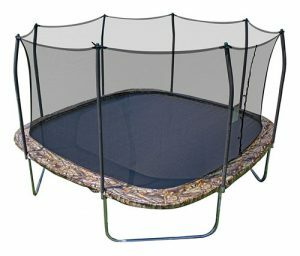 We recommend this particular in ground trampoline for buyers who are looking for smaller trampolines that won’t take up much room in the yard or have younger children. Also, some home owner associations have requirements for trampolines and this meets all the usual requirements. 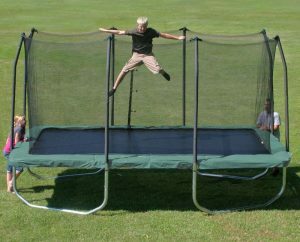 The Jump Sport In Ground Trampoline is a rectangular trampoline coming in a 10 foot or 12 foot size. Some features are: 72 – Heavy Duty Galvanized Steel 5 1/2 Inch Springs to resist rusting. Included Safety Net. Sturdy Galvanized Steel Tubing & Frame. UV resistant. Heavy-duty hardware and weather-resistant rope. Patented T- Frame joint piece for stronger and simpler connection. Weather resistant polyethylene net. There are some specific requirements for in ground trampolines to work well for you. A decent sized hole will need to be dug in the yard at a depth that should be a minimum of 36 inches. You’ll have to consider how to drain that hole to keep water from collecting and some sort of retainer wall should be provided to the walls of your dug hole don’t collapse. We recommend this Merax Trampoline to anyone looking for a trampoline that comes with great accessories and a sturdy, well built design. 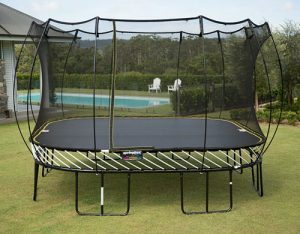 This particular trampoline not only includes the basketball hoop, but also the safety enclosure net and a ladder. 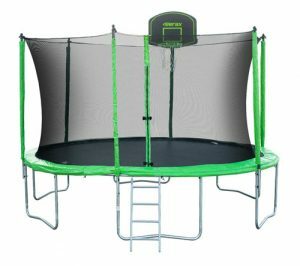 The features we like most include: A sturdy, metal basketball hoop instead of the usual cheap plastic hoops included with other trampolines. A 330 lb. weight limit while many other trampolines in this range are 200 lbs. Additional features include: Frame constructed of heavy Gauge galvanized rust resistant steel with total of 6 W-shaped legs for added stability. Heavy-duty 4- step galvanized steel ladder. High quality UV-proof safety enclosures. As we mentioned above, rectangular trampolines are the best backyard trampolines you can buy. While this is true, square trampolines, are a very close runner up. Square trampolines offer great jumping space, great bounce, and great stability. Because they are square, you usually can find the right spot in your yard for them as well. If you are looking to expand the use of your trampoline, adding a trampoline tent is an excellent way to do so for your family. Trampoline tents can create a space for kids that can be used for camping out in the backyard or as a club house. 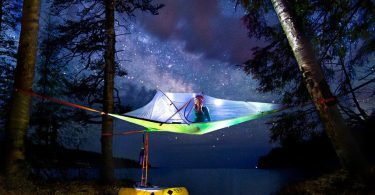 This trampoline tent is not a trampoline itself, it is to be used with your existing trampoline. 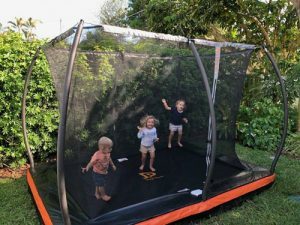 We have included it in our reviews of the best trampoline because it is a very popular addition to backyard trampolines and easy to use once you have a trampoline set up. It’s very easy to setup and take down, so if you want to use your trampoline again as a standard trampoline, you can do so easily. 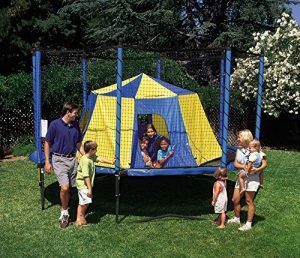 This partiuclar trampoline tent features: Giant 11 Feet Across, 5 1/2 Feet High. Patent Pending No-Pole Safety Design. 3 Windows & 1 Door with Screens & Zippers. Designed specifically for use with JumpSport Safety Enclosures, and is NOT guaranteed to work with other brands of enclosures. Fits ONLY 12′ – 14′ Round Trampolines. After much research, we are confident that the Springfree Trampolines represent the safest trampolines for sale. The extra safety features come at a premium price, but if safety is your biggest concern, price is less of an issue.